REISTERSTOWN, Md. 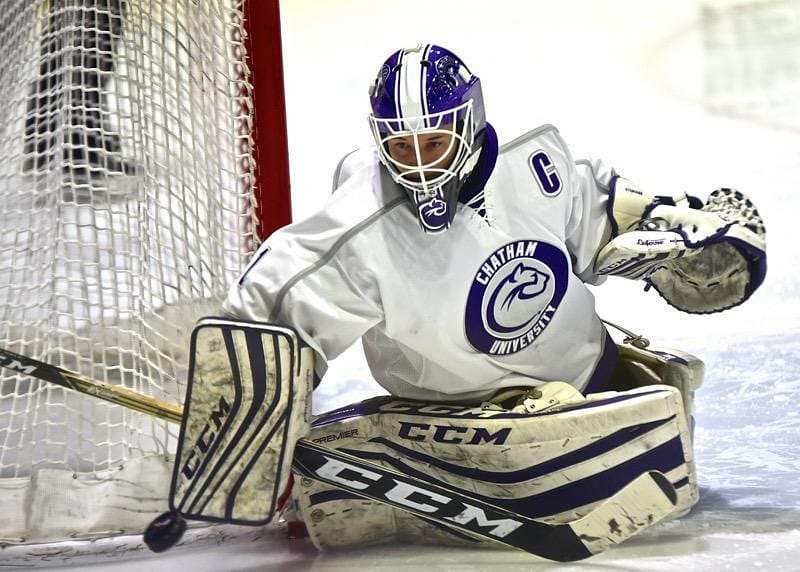 –The Chatham Cougars women’s hockey team secured a hard-earned weekend split with the Stevenson Mustangs. After falling 2-1 in the opening game, the Cougars kept their playoff hopes alive with a 4-2 win on Saturday. In game one, Devon Strachan would start her second straight game. The Cougars penalty kill unit had plenty of ice time in the first period as Chatham took three straight penalties to start the game, but they stood tall killing all three penalties. As the Cougars returned to even strength they changed momentum. With just 1:25 remaining in the first, first-year Sydney Collins buried the puck off a scramble in front of the net giving the Cougars a 1-0 lead at the break. Strachan shined in the first, stopping all 11 shots thrown her way. In the second, both goalies stole the show as the teams traded chances. Strachan stopped 19 shots giving her 30 saves through two periods. The Mustangs had five power play opportunities but did not capitalize making them 0-8 after two periods. Although the Cougars were mostly on the penalty kill, they had their chances as Stevenson goalie Annika Carlander robbed Kristina Block, Madison Black, and Kerry Carr, who all had shots from point blank range. After two periods, the Cougars had 1-0 lead as they looked to pick up a big conference win. However, just 48 seconds into the period the Cougars once again found themselves shorthanded. On their ninth power play, the Mustangs would make them pay. After a pair of great saves from Strachan, the puck ended up sitting on the pad of a sprawled Strachan and Cierra Siemasko shoveled it in the back of the net tying the game just 1:59 into the third. The Mustangs scored again with under four minutes remaining and the Cougars were unable to overcome the 2-1 deficit. The Cougar penalty kill went 8-9 and Strachan shined saving 36 of 38 shots during the game. Game two had a different script as the Cougars pursued a much needed win. Penalties proved to be an issue once again as just over half way through the first the Cougars were back on the penalty kill. The Mustangs capitalized as Nikki Kendrick ripped one past Strachan. The Cougars continued to push and would get the equalizer 4:27 later. Junior Holly Ackerman won an offensive zone face-off cleanly back to Jillian Rowland, who side stepped the defender and ripped a shot from the point. Ackerman got the rebound and blasted it past the glove of Stevenson goalie Annie Smyth-Hammond tying the game at 1-1. As the second period began, the Mustangs scored their second power play goal of the game when Kellen Wittman ripped one over the shoulder of Strachan making 2-1 Stevenson. The Cougars responded well applying strong offensive zone pressure. This would lead to a Stevenson penalty which provided the Cougars with a much needed spark as they tied the game. Sydney Collins would get her second of the weekend firing one past the glove of Smyth-Hammond from the right slot. The score would remain tied at two heading into the second intermission. Just 58 seconds into the 3rd, the Cougars gained a 3-2 lead as Rowland would take advantage of a bad Mustang change. She skated in from neutral ice going forehand backhand to beat Smyth-Hammond for her team leading eighth goal and team leading tenth point on the season. The Cougars would not stop there and increased their lead as senior captain KJ Frost wrapped around the net and buried it through the five-hole of Smyth-Hammond making it 4-2 with 9:16 left in the game. The last nine minutes of the game would not come easy for the Cougars as Michelle Jones would receive a 5-minute major and game misconduct penalty. Goaltender Devon Strachan took over making several outstanding saves from point blank range. Strachan proved to be the hero for the Cougars in a game that could have swung in Stevenson’s favor but the Cougars held on and picked up a huge 4-2 win. With the split, the Cougar’s record stands at 5-12-0 overall and 2-8-0 in UCHC. The Cougars will be back in action this weekend when they host the Neumann Knights in a pair of UCHC games with Friday’s game starting at 7:10 p.m. and 3 p.m. on Saturday. Both games will be at the Frozen Pond. RICHLAND TWP., Pa — The Men’s hockey team went 0-1-1 on the weekend in a pair of makeup games. In game one, the Cougars gave the #14 Fredonia Blue Devils all they could handle before falling 2-1 in overtime. Sunday’s game against the Neumann Knights ended in a 1-1 tie. In game one, Fredonia peppered sophomore goaltender Matt Calas early with 13 strong shots on goal. The Blue Devils were finally able to break through halfway in the first when Victor Tracy picked up rebound and backhanded the puck over the glove of Calas to make it 1-0. The Cougars were able to claw back late in the first when Matthew Ho and Michael Lamison found themselves on a 2 on 1. Ho fired one on Fredonia goalie Eric Bogart and the puck deflected from the stick of Bogart and off the body of Lamison and in the back of the cage, tying the game at one. The play was briefly reviewed before Lamison’s 4th goal was confirmed. Chatham found themselves in a 1-1 hockey game with the 14th ranked Blue Devils after one period. The Blue Devils and Cougars traded chances in the second but both goalies were up to the test and kept the game knotted at one. Calas made another 10 saves in the second while Bogart stopped seven. The Cougars played their best period in the third as they put 13 shots on goal, but once again Bogart shined, stopping every opportunity including a great pad save on a two-on-one opportunity. Calas had another strong period stopping another 16 shots. The game went to overtime and the Cougars could smell the upset as they had the 14th ranked team on the ropes. Both teams shifted into a defensive mindset as neither team could get a shot on goal. With 48 seconds left, the Blue Devils won a face-off and Jacob Haynes took a shot from the top of the left-wing circle which beat Calas on the short side. Fredonia avoided the upset with a 2-1 OT win. NEW KENSINGTON, Pa. — Sunday’s game against Neumann Knights had Matt Calas back in goal again. This game started much like the first game of the weekend as the Cougars would fall behind early. With Neuman on the power play, Thomas Mans Bridge scored at the 4:46 mark giving the Knights an early 1-0 lead. Both teams traded chances in the remaining minutes of the period, but both goalies held their own as sophomore Mike Cosentino from Neumann would stop all 14 Cougar attempts while Calas stopped 11 of 12 shots. The second period started much like the first as the Cougars found themselves shorthanded again. Instead of Neumann increasing their lead, the Cougars tied the game on a shorthanded goal. Eric Hildebrand picked up the puck in neutral zone leading a two-on-one with Johan Allingmon. Hildebrand slid the puck over to a streaking Allingmon who blasted the puck past Cosentino, tying the game at one. The game would stay tied heading into the break, but not without excitement as the Knights applied a lot of offensive zone pressure. After an outstanding glove save by Calas, the puck would find itself sitting behind Calas in the blue paint with former Cougar Dan Cangelosi looking like he had an easy tap in. However, Cougar Mitch Popp came in to clean up the garbage keeping the game tied. The Neumann Knights came out flying in the third playing their best period of the game with 18 shots on Calas who was perfect in the period. However, the Cougars were unable to break Cosentino on the other end and for the third straight game the Cougars found themselves in overtime. The Knights strong play carried over into the overtime as they dominated the Cougars peppering Calas with 5 shots while the Cougars did not record any. The game would end in a 1-1 tie with Calas making 43 saves on 44 shots while Cosentino stopped 33 of 34 shots. The game may have ended in a tie, but there was still a point on the line and the game would go to a 3 on 3 overtime period per the new UCHC conference rules. After a failed two on one by the Cougars, the Knights got the puck to Tommy Dougherty who found himself all alone beating Calas going forehand backhand and depositing the puck through Calas’ five-hole for the extra point. After an exciting weekend of the action the Cougars are 4-10-2 overall and 2-6-1 in UCHC. The Cougars will be back in action Saturday at 7:10 p.m. when they take on the Stevenson Mustangs at the Frozen Pond Arena.